Page 13 is for MODERN accessories only. A watch that flashes and spins! 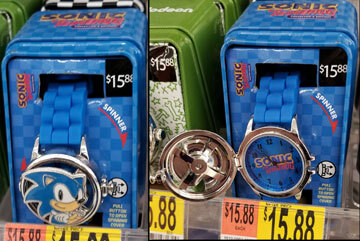 This is another 'gimmick watch' styled for classic Sonic. This is sold at JC Penny stores, in the 'kids accessories' area in 2018. The box is very Sonic-centric with designs and faces all over. 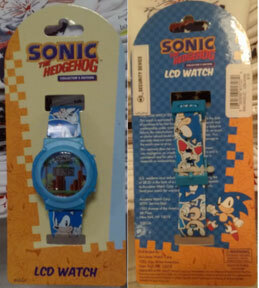 The watch is a simple one though, it has that little rectangle window for the actual time-piece part (so, that is generic) and the face is printed with Green Hill graphics, plus a Sonic. The band also has Sonic art all over it, and a traditional metal buckle. The gimmick is white LED lights under the face. They appear to shine 'colors' because they show through the colored art. The lights blink, and twirl when you activate it with the button on the side. 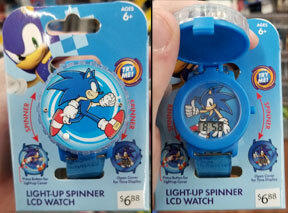 It's an exciting gimmick to get kids to want to wear a watch--though it doesn't have a whole lot to do with Sonic, other than illuminating him with colors. This should be about 14.99 if you find it in stores. 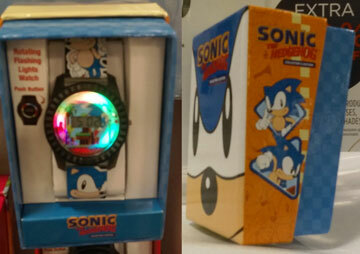 This is a simple Sonic watch, also found at JC Penny Department stores, just like the one above. It too is likely to be in the Kids section, or in Kids accessories. This one doesn't have a gimmick, so it is only about 10 dollars if you can find it. 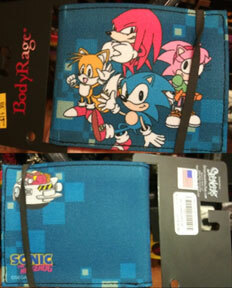 It's carded, and has classic Sonic art all over the band, but a plastic blue buckle. The face has a Green Hill scene, and small classic logo. The clock part is that little simple/cheap rectangle which is always re-purposed into inexpensive kids' watches, no-matter the branding. 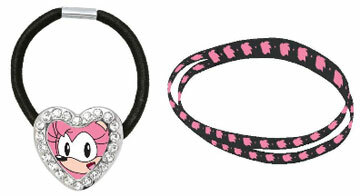 With a blue edge part, busy band, and recognizable scene for the face, it's a well decorated, standard Sonic accessory. Is Bio World back on Sonic in 2018? It seems so, because here comes a pair of simple socks. These are adults sizes Sonic themed socks. They have fairly large classic faces scattered all over. They're a normal length, & the designs are sewn in, so there's no graphics to rub off or wear out. They have a blue toe tip, heel & cuff. They are available at GameStop stores...but are they anywhere else? You can see the BioWorld logo there on the classic type paper tag. 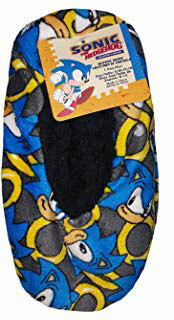 Photo by Taaron Here are Sonic "Slipper Socks" but only for little kids. Look at the proportion, they're not likely to fit many people. They're classic style, with Sonic faces & rings scattered over a gray background. The paper tag has 'collectors edition' (but why? it's a bit nonsense) Where are these sold? But these are pretty original looking, each in a character color & with a big face right on the top of the sock, rather than a pattern. You get Sonic, Knuckles, Super Sonic, Eggman & Tails. 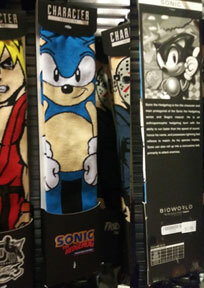 This is the first time Super Sonic has been on a sock! Eggman's sock is black, it's the only one that doesn't go with the character color. It's 'wacky grinning big tooth/classic' Eggman. These are fun because they are both classic & atypical...it's too bad they're only in kids sizes so they won't fit most feet. But, where could you find them & how much does it cost? Here's another gimmick Sonic watch, but instead of lights, this one has a 'fidget spinner' or just regular rotator-type top. The watch has a snap open "lid" that houses the easy-rotating metal & enamel Sonic face. You can whirl the watch top as you do a fidget spinner, then open it to see the time. If one spinning watch wasn't enough...here comes another! A 3-Pack of Sonic underwear appears in 2018! Are these the FIRST Sonic hair accessories? They could be...and they star Amy Rose! Here, classic style Amy has a portrait in a rhinestone-ringed heart shape charm. The charm is metal, and attached (probably like a bead) to a thick black elastic hair band. The second item is a springy / soft elastic fabric double head band. This is black, and has repeating pink Amy sihloutte heads all along it. These are Sega Shop winter 2018 / 2019 items, and should be about 13 dollars each....which is steep for these fairly simple items. Charm-band headbands like this as you may have seen online are also favored by fakers. There are machines in China that can set any design in the center of the generic charm, and that's what's been done here...only by SegaShop which makes it official. 13 dollars for a headband or a single hair tie though---the SegaShop always seems costly even if these are the first Sonic hair accessories to get made. 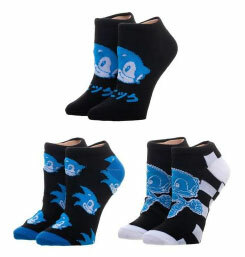 These are called the "Japanese Design 3 Pairs Sonic Socks"
These are a bundle on the Sega Shop in 2019, and should be about 13 dollars for the set. They are adult size socks. Each pair is black, with woven-in blue Sonic designs. The top pair has a classic Sonic face with his name spelled out in Japanese letters under it. The left pair has a blue toe & scattering of the same Sonic face. The right pair has a white toe, heel & stripes under the foot. That Sonic design is the 'side jumping' classic Sonic that was mostly seen in Japan. So, the set sort of lives up to the 'Japanese design' label. Woven-in designs don't wear off/wear out easily, and adult sizes are always a good sign. 13 for 3 pairs isn't a super great nor super bad price. The sturdy & decent design plus ok price makes these an all right set to get. 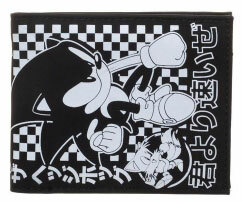 This is called the "Japanese Design Sonic Wallet". It is a Sega Shop item, new for 2019, and costs 18 dollars. It's made of that sturdy nylon tight-woven cloth, and is a simple bi-fold wallet. It's all black, printed with white ink. It has a small checker background, and 3 point pose classic Sonic. Look at the little circle there in the corner: cute Tails is walking along! There are words printed across the front edge & all up one side...but what do they say? See those complex ones? Those are Kanji & you can't really look them up because they are not letters. The SegaShop won't tell you what the words are either....do they even know? *It seems stupid to not provide a translation on the site where you're selling something. People would want to know before they shelled out 18 bucks on anything. The little Tails circle makes this really cute! The unusual (in America) stock art is a good touch, as is the size of the art. This is a well-thought-out piece, and a nice wallet to collect. The price isn't too terrible either. With this one, the Sega Shop does a really nice job. These are by Bio World, and are a part of their "Character" sock line. As you can see, they've also got Street Fighter Ken & Horror Movie Jason on their line along with classic Sonic. These are gimmick socks, they're knee-highs with the character either compressed (Ken) or stretched out (Sonic) to fit the long rectangle shape of the sock. Sonic is suffering from a bad case of 'big body' and the arms are shown kind of growing out of his chin a bit? Also, the legs seem like they are too far apart at where the hips would be, and go strait down....all this combines to make it a very strange pose, alsong with his hands just sort of...down and fists. The packaging has a blurb about Sonic, how he's the star of his fast moving 1990s video games, and continues to be popular today, etc. (It's noting amazing, just some extremely standard information) This is a Spencers' Gifts item and is likely 12.99 for 1 pair of odd gimmick socks in 2019. Spencers Gifts brings another Sonic item for 2019. This time it's a simple bifold canvas wallet. 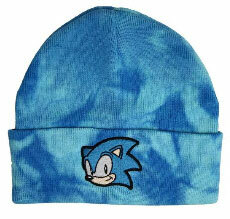 It's classic style, with Sonic, Tails, Amy Rose & Knuckles on the front. If you turn it over, there's fun little Eggman in his Egg o Matic in the top corner on the back, along with the classic logo. It helps that all the stock art used here is neoclassic, for some new poses. It looks like "Body Rage" is the brand that produced this...and it seems like an 'ok' wallet. It's held shut by an elastic band (these can wear out, especially in hot/damp climates) and the 'canvas' type fabric feels very rough & stiff. This is an item where you should feel the quality for yourself first, before you buy...which is why it's nice to know that it is in Spencers stores in malls in winter 2019. Here is a hat from Spencers Gifts in 2019. This is called the "Tie Dye Beanie Cap"
But...it doesn't really look traditionally tie-dyed as there's no rainbows, swirls or the signature 'marks' of the tiedye process. It's more of a 2 tone mottled blue color for the knit beanie hat. 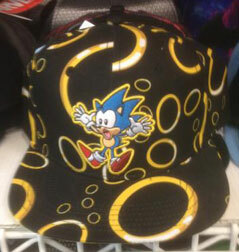 The only Sonic element here is an all-embroidered classic style Sonic face on the front of the roll/flip up part at the bottom of the cap. Want some cool modern designs on some fun ankle socks? Are you over 7 years old? Too bad! These socks aren't for you then...unless you're Cinderella with super tiny feet. in a cardboard display with other packs of popular character themed socks. The problem with them is that they're "one size" and that size is only for very little kids. The socks have varying stripe patterns, but what's super is the variety of characters you get. Sonic is on a black/gray stripe, Tails on a blue/dark blue stripe, Knuckles is on blue/navy strip, Shadow is on white/black stripe...and then you even get Eggman on a thin gray.white stripe.